There was never even a proposal! Mohit Arora (19), an engineering student, today drowned in the gushing waters of a seasonal rivulet (N-choes) passing through Rose Garden in Sector 16, here, this afternoon. Mohit had gone to the garden with his two friends, Pradeep and Ashok, where he drowned while playing in the rivulet. 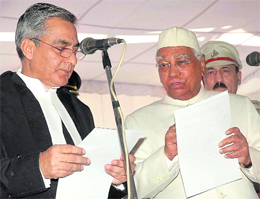 Justice Tirath Singh Thakur was sworn in as the Chief Justice of the Punjab and Haryana High Court by Haryana Governor Dr A.R. Kidwai at a brief but impressive ceremony held this morning. The ceremony started at 9 am sharp and was over in less than 15 minutes, enabling the High Court Judges and the advocates to attend the court proceedings on time. The RTI ghost continues to haunt the UT administrator. Social activist Hemant Goswami, who forced the office of the UT administrator to appoint central public information officer (CPIO), has filed another application before the chief information commissioner (CIC), alleging violation of the May 13 CIC order. All government as well as private schools of the city will celebrate Independence Day at Sector 17 Parade Ground on August 15 only. It has also been decided by the Administration to declare next day i.e. August 16, as holiday. The UT Administrator has denied permission to the city’s mayor to visit France later next month in connection with the city’s claim to heritage status. It is learnt that the permission has been denied on the pretext that there was no need for two functionaries Pardeep Chhabra and MC commissioner Roshan Sunkaria to undertake the visit. DSP Jasbir Singh Cheema, the officer inquiring into the allegations levelled by sub-inspector Poonam Dilawari against DSP Satbir Singh, failed to submit his report even today. After reeling under power cuts for almost a month, Mohali residents are now heaving a sigh of relief. A protest by BJP activists from Punjab over the revocation of land allotted to the Amarnath shrine took a violent turn this afternoon leaving over 24 activists, including, several police personal injured, when the police lathi-charged the protestors trying to breach the security cordon. The Mohali SDM has asked GMADA and the PSEB to get all illegal colonies removed which had come up in areas above which high tension wires passed to avoid incidents of electrocution. Residents raised slogans against the administration when the water from the overflowing nullah entered hundreds of houses in Rajiv Colony here today. They alleged that the administration had failed to take corrective measures even as water from the nullah inundated the colony every time the region witnessed heavy rainfall. 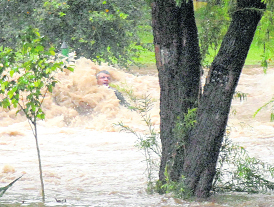 Rain fury continued to haunt residents of Chandigarh and its surroundings areas today. With the area experiencing a moderate rainfall of 19mm, life was virtually thrown out of gear. Traffic came to a halt at several places and power supply was affected, sending out a message that the city cannot even withstand moderate rainfall. The Chandigarh administration has decided not to charge interest on the balance conversion fee from the applicants of two kanal plots who could not submit their revised building plans due to delay in finalisation of zoning of these plots. Putting all speculations to rest, UT IGP S.K. Jain today confirmed that the NCB has named only six police officers in its report about the nexus between policemen and drug-peddlers. At the receiving end for ignoring parking norms while allowing multiplexes under the Industrial Conversion Policy and under the Multiplexes Policy for other parts of the city, the Chandigarh administration will allow multiplexes on plots measuring two acres and above. 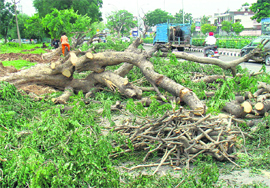 The Greater Mohali Area Development Authority today undertook cutting of trees along the dividing road between Phases VII and VIII to facilitate its widening. According to GMADA chief Vivek Pratap Singh, the road would be widened to 200 foot and this would include a service road on the Sector 69 side. 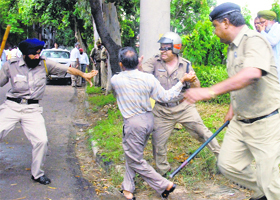 The UT police today placed sub-inspector Paramjit Kaur Sekhon under suspension on charges of insubordination. It was due to the efforts of Congress chairperson Sonia Gandhi that the RTI Act came into existence in 2005. Finally, the Panjab University authorities have woken up to the seriousness of the ragging menace on the campus. Acting tough on students, the authorities today expelled six second-year students of the department of Indian theatre from the university. This year, three incidents of ragging in Panjab University have come to light till now. Interestingly, all three incidents have been reported from the boys hostels and involved students from professional courses. The incident that took place on Saturday night was the first that involved students from the department of Indian theatre. Alexander von Humboldt Foundation, Germany, has invited Dr K.N. Pathak, professor emeritus and former vice-chancellor, PU, to visit research institutes and academic colleges in Germany as well as to strengthen ties between him and Humboldt Foundation, Germany. The result of the Class X compartment examination held on July 19 was declared today. According to a communique received from the CBSE here, 9,742 candidates had appeared for the test. The police today resorted to water canons and tear gas shells to disperse members of the Sikh Students Federation (SSF) when they tried to cross over barricades in Sector 17 here this afternoon. The crisis in the Punjab and Haryana High Court over the appointment of more Judges seems to have ended with the arrival of the new Chief Justice. The newly-appointed Chief Justice, Tirath Singh Thakur, has made it clear that there is no "immediate need" to recommend more names for elevation. A CBI Special Court of Jagdeep Jain today sentenced Sunil Beri, junior assistant in the State Transport Authority (STA), to one-year’s RI for taking bribe. Doping has once again surfaced in Indian sports. This time it’s not the dope-infested iron sport of weightlifting. Now, two junior national-level grapplers have been caught for doping violations. PSEB chairman Y.S. Ratra today said due to comfortable power supply position in the state, the board has withdrawn the second weekly off day of induction furnaces and steel rolling mills and 12-hour additional cuts on category-II feeders for Saturday and Sunday. A three-year- old child was electrocuted when he came in contact with a cooler here today. The victim has been identified as Lavish Kumar, son of Mintu, residing in Bhung Mohalla in ward number 21 of the town. India winning its first gold at the Olympics was celebrated in a big way in Ambala today. Elated residents distributed sweets and burst crackers. The Education Department today sought an explanation from six government schools after finding certain discrepancies in the sports funds expenditure. Two Chandigarh boys have created history in the world of sports. While shooter Abhinav Bindra became the first Indian to clinch an individual gold at the Beijing Olympics on Monday, golfer Jeev Milkha Singh became the first Indian to finish in the top 10 of a US Major on Sunday when he occupied the ninth slot in the US PGA Tour at the Oakland Hills Country Club in Michigan. A 24-year-old son of a UT police inspector allegedly hanged himself to death at his residence in Sector 42, here, early this morning. According to sources, Ravinder Singh, son of Kehar Singh who is posted as an inspector in the CID wing, was found hanging from a ceiling fan. Kehar Singh was the first to notice his son hanging after he broke open the door of Ravinder's room.